The Spirit Rises is released in a earth-friendly recycled chipboard DVD-sized Digi-pak, in a limited hand-numbered first edition of 1000 (they will be hand-numbered by Projekt founder Sam Rosenthal). An additional 100 (non-numbered copies) are going to press, radio and friends. When this ultra-limited edition is sold out, a 2nd edition – in an entirely different format – will be created. 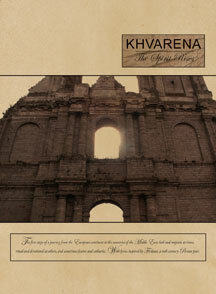 Khvarena is a journey across time and countries, into the ethno-heavenly voices realm from which the spirit will arise. Khvarena is a striking encounter between Europe’s North and South: the Italian maestro Francesco Banchini of Gor and France’s Jeanne & Fabrice Lefebvre of Rajna. Together they create The Spirit Rises, the first steps of a journey from the European continent to the countries of the Middle East; lush and majestic at times, ritual and devotional at others, and sometimes festive and cathartic. A myriad of ethnic instruments (clarinet, saz, zurna, bendir, riq, derbouka, santoor, medieval flute, tampura, udu, singing bowls, swara tampura, crotal, bouzouki…) accompany the entertwined vocals of Jeanne and Francesco, singing lyrics inspired by Firdausi, a 10th century Persian poet. This is music of brightness, color and emotion with enrapturous Arabic overtones.